Look how far the iPhone has come. CEO Tim Cook holds the billionth iPhone at an employee meeting in Cupertino. Image source: Apple. Ten years ago today, Steve Jobs introduced the product that would reshape not only Apple (NASDAQ:AAPL), but also the world. That Macworld presentation will always be considered Jobs' greatest product introduction ever. In what now seems like common sense, Jobs noted that dynamic virtual buttons on a capacitive touchscreen enable endless flexibility and interface innovation, while "the bottom 40 [percent]" of all prior phones were occupied by physical buttons. Note that Apple wouldn't actually launch the device until June 2007, a rare instance of the company preannouncing a product. A decade ago, mobile computing meant carrying your laptop around with you and hoping to find a Wi-Fi hotspot. Nowadays, it means having any number of cellular-equipped mobile devices always within reach, be it a smartphone or a tablet. Apple's turnaround had already taken shape circa 2006, and the company was on firm financial footing thanks to the iPod's success, but the iPhone catapulted Apple to becoming the world's most valuable company. Here are 10 charts to celebrate the iPhone's 10th birthday. Last year marked the first time that Apple posted a year-over-year decline in iPhone unit sales. While the initial investor reaction was to fret, it's worth taking a moment to appreciate the incredible run. Over the summer of 2016, Apple sold its billionth iPhone. Apple hosted an employee meeting to display the billionth unit (pictured above). Here's how it got there. I personally purchased shares of Apple for the first time in 2006, in July of that year for $60.83 (pre-split). Needless to say, buying Apple the year before the launch of the iPhone has been quite an investment. Shares are up 800% since the day of the unveiling. Before the iPhone, smartphones were a luxury relegated to the enterprise or high-end power users. The iPhone made smartphones approachable and easy to use, spurring mainstream consumer adoption. There are now over 2.5 billion smartphone users worldwide, according to KPCB's Mary Meeker. Image source: KPCB Internet Trends 2016. The next few don't go as far back, since Apple has changed its financial reporting a couple of times over the years (which breaks financial continuity). On a trailing-12-month basis, the iPhone became a $150 billion business in 2015. With the iPhone stalling in 2016, this figure has come down to "just" $137 billion. (The iPhone alone would rank as No. 12 on the Fortune 500.) Compare that to the $2.5 billion in revenue that the iPhone generated in its first year on the market (although Apple was required to account for iPhone sales under subscription accounting back then, stretching out revenue recognition). It's common knowledge at this point that the iPhone is Apple's most important product by far, generating over 60% of sales. This proportion has also risen precipitously over the years, and is currently around 63% on a trailing-12-month basis. In its first year, the iPhone accounted for 8% of sales (same caveat about subscription accounting). Data source: SEC filings. Chart by author. Calendar quarters shown. TTM = trailing 12 months. A couple of months ago, Strategy Analytics estimated that the smartphone industry collectively generated $9.4 billion in operating profits in the third quarter. Of that pie, Apple bagged a staggering 91% of the industry's profit, thanks largely to its superior pricing power. It also helps that Apple's scale affords it better leverage when negotiating component pricing, helping to reduce costs. Other estimates actually peg Apple's proportion of industry profits at over 100%, since most other companies' smartphone operations only generate losses. Data source: Strategy Analytics. Chart by author. Speaking of superior pricing power, Apple has a unique ability within the smartphone industry to price at a premium with little pressure to reduce prices. Average selling prices (ASPs) are generally resilient (albeit with natural fluctuations), with no signs of deteriorating even amid intense competition. Apple is the only smartphone manufacturer that simply chooses not to participate in lower-end pricing segments. Rapid commoditization of Android original equipment manufacturers has led to intense price competition and eroding prices and profits for the entire Android army. Of course, the upside of this approach is dramatic gains in unit share -- Android is by far the most dominant mobile platform today. Data source: KPCB Internet Trends 2016. Chart by author. Estimates for 2016 as of June 2016. With the rise of the iPhone, the App Store has grown in lockstep. Apple announced just last week that it paid out $20 billion in 2016 to developers, and there are now over 2.2 million apps available from the repository. Apple often notes that it has created an entire app economy, and it's not lying. Data source: Apple. Chart by author. 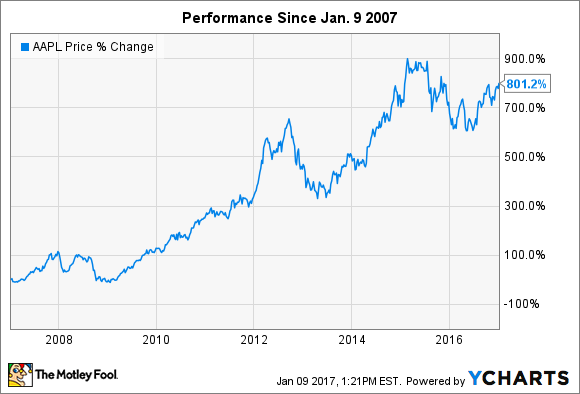 It's been a great decade for Apple and its shareholders. As much as investors would enjoy 800% gains from current levels, it would be too much to ask of the next decade.